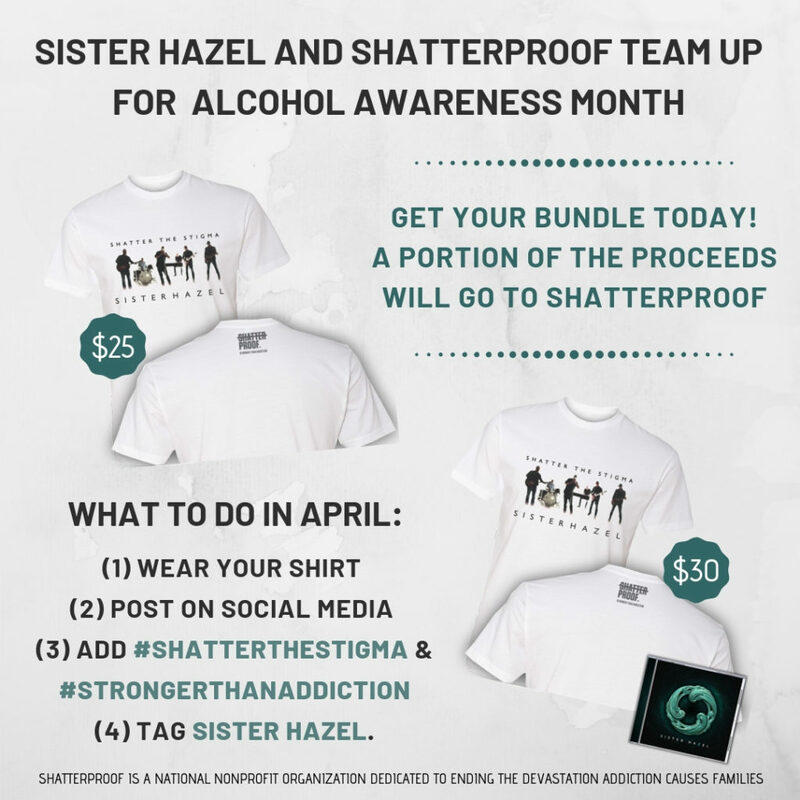 Platinum-selling band,Â Sister Hazel,Â isÂ teaming upÂ Shatterproof,Â Â a national nonprofit organization dedicated to ending the devastation addiction causes families.Â Beginning in April for Alcohol Awareness Month, fans are encouraged to get involved and share their story of how addiction has affected their life by purchasing a “Shatter the Stigma” T-shirtÂ hereÂ and sharing on social media.Â A portion of these proceeds will benefit Shatterproof. Prices/Bundles are $25 for the T-Shirt andÂ $30 for the T-Shirt/CD. 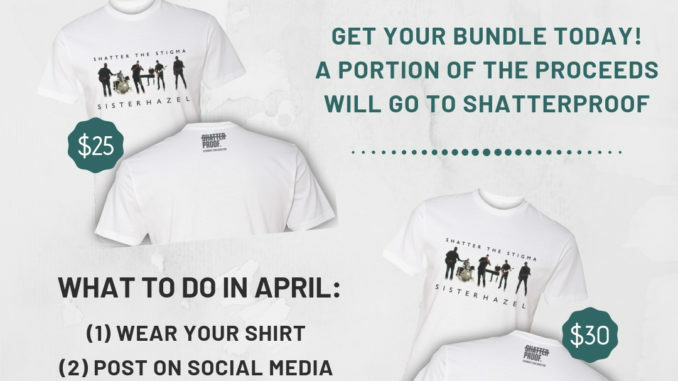 Fans are asked to purchase and wear their shirt, post on social media using #ShatterTheStigma or #StrongerThanAddiction, and tag SisterHazel. Sister Hazel will continue captivating audiences on tour this summer with theÂ 14th Annual Hang at Hazelnut Isle,Â CMA Music Fest,Â and much more.Â For a full list ofÂ tourÂ dates visitÂ http://sisterhazel.com/tour/. 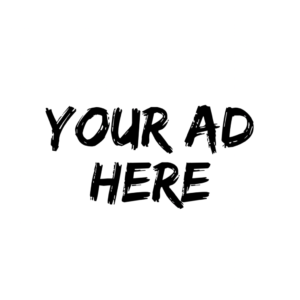 Shatterproof is a national nonprofit organization dedicated to reducing the devastation the disease of addiction causes families. Shatterproof works to end the stigma and foster a community of support, providing evidence-based resources to support prevention, treatment and recovery. Shatterproof advocates for changes in policy at the federal and state level and supports the development and implementation of evidence-based solutions for substance use disorders. Originating from Gainesville, FL, Sister Hazel is comprised of five gifted, seasoned musicians whose well-spring of natural talent has been called “one of the Top 100 Most Influential Independent Performers of the last 15 years” byÂ Performing Songwriter Magazine. Song “All for You,” topped the adult alternative charts during the summer of 1997 and the success propelled their album to platinum status. In their first showing on the country music charts they made a strong debut with â€œLighter In The Darkâ€ at #4 onÂ Billboardâ€™sÂ Top Country Albums chart, #6 onÂ Billboardâ€™sÂ Independent Albums chart, #30 onÂ Billboard’sÂ Top Current Albums chart and #79 on theÂ BillboardÂ 200 album chart. The band landed onÂ Billboardâ€™sÂ Top Country Albums Chart again in 2016 with â€œUnplugged From Daryl’s House Clubâ€ at #75. In February 2018, â€œWater,â€ Volume I of a collectible compilation series titled, â€œElements,â€ landed on theÂ BillboardÂ Country Albums chart at #9 and at #2 onÂ Billboardâ€™sÂ Independent Albums chart along with making their debut on the most revered stage in country music, the Grand Ole Opry. Elements Volume II â€œWindâ€ and Volume III â€œFireâ€ both debuted at #1 onÂ iTunesÂ and on top of theÂ BillboardÂ Independent Chart, Americana/Folk Chart, and Country Album Sales chart. Living up to their fan-centered reputation, the band was a pioneer in the themed cruise industry by co-founding “The Rock Boat” and annually hosts events like the â€œHazelnut Hang,â€ and “Camp Hazelnut” that focuses on creating unique experiences and interacting with the fans. Sister Hazel has been equally attentive to connecting with their audience through social media having amassed over a million social followers. In addition to the events and touring, the band also gives back with â€œLyrics For Life.â€ Founded by singer Ken Block, the charity unites musicians and celebrities for concerts and auctions to benefit cancer research and patient-care charities. CHARLIE DANIELS’ NON-PROFIT THE JOURNEY HOME PROJECT PARTNERS WITH RICH POVERTY ORGANIZATION FOR VETERANS ART EXHIBIT AT THE PENTAGON IN WASHINGTON, D.C.